Ahhh, the technology gods kept any gremlins at bay during my Threadwork presentation at my quilt guild [Choo Choo Quilters] last night. An attentive audience of guild members and visitors went with me on a look back into Threadwork history starting with the Industrial Revolution's Victorian crazy quilt era, through the turn-of-the-century redwork, the resurgence of needle arts and crafts of the mid-20th century to more current award-winning quilts of Caryl Bryer Fallert, Hollis Chatelain, Libby Lehman and other threadwork masters and fiber artists like Tom Lundberg, Ellen Anne Eddy and Kaffe Fassett. With my new iPad, I was able to share lots of photos as examples—which greatly enriched the program. We discussed influences and design sources for the threadwork trends—one of which was an exhibit of Japanese ceramics at the 1876 Centennial Exposition in Philadelphia. I also discovered many interesting tidbits while walking down the research path. Did you know that some of the products first displayed to the public at the 1876 Centennial Expo were: Alexander Graham Bell's telephone, the Remington Typographic Machine (known to us as the typewriter), Heinz ketchup, Hires root beer, and (wait for this one...) kudzu?? Ya never know what you will find en route to researching a quilting topic. 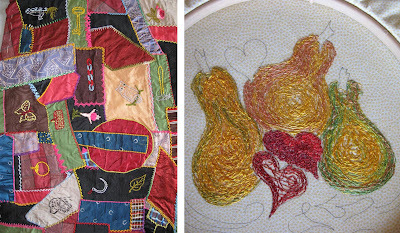 The "Continuing Education" project from this program is to use a photo as inspiration to create a series of 3 pieces using any threadwork technique(s)—hand and/or machine. Many of the quiltmakers and needle artists whose work we viewed in my program work in a series. One of my favorites, a terrific teacher and prolific quilter as well, is Carol Taylor. Check out her work here. Working in a series is a vehicle for developing and mastering a concept, theme, tool or technique. The evolution and discoveries from working in a series can be very beneficial. In our textbook, "Fearless Design for Every Quilter ," Lorraine Torrence says this about working in a series: "Quantity generates quality." Very much along the lines of, "Practice makes perfect," wouldn't you say? Just wanted to say "thank You" Veronica for an excellent presentation on threadwork and its history. I learned quiet a bit and intend on doing the challenge so we will see. I appreciate all the wonderful work you put into it.